What is a mermaid monofin? 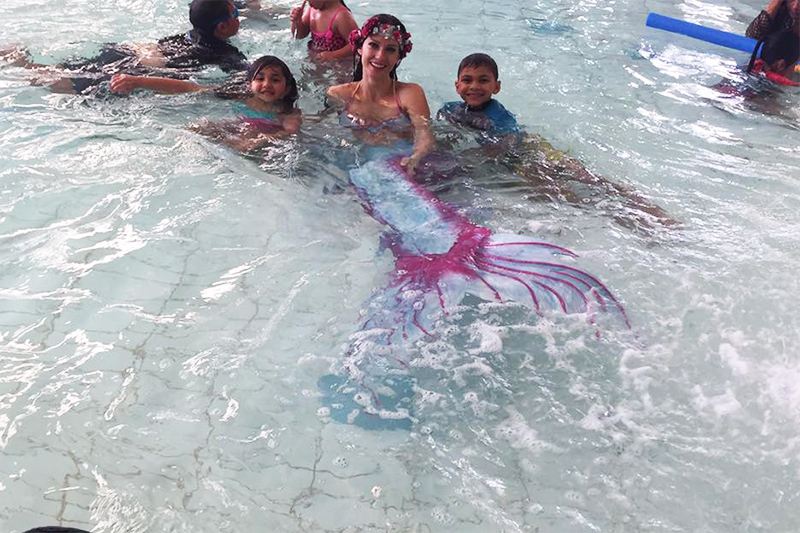 A mermaid monofin is an essential part of the equipment needed to be a real mermaid or merman. These special monofins can either be integrated into the mermaid tail permanently or with the help of Velcro, zippers or other aids be integrated so it can easily be removed and replaced. In contrast to bifins, we know from scuba diving or snorkeling, a mermaid monofin has both feet mounted side by side. The basic movement is the same as the way dolphins and whales swim underwater. You start the movement in the center of the body and it runs like a wave through the entire body right down transmitting the energy into the mermaid monofin. Optionally, you can stretch the arms forward or have them along the side of your body. If done properly you can achieve extremely efficient propulsion and high speeds by using a monofin in the water. Beginners often think that the force is generated in the knees but this is not true. The knees only bend slightly due to the flowing movement which makes the movement look so natural. The mermaid monofin is very popular not only with real mermaids but also with freedivers. Monofins are also seen frequently in freediving competitions. The swimming motion of a mermaid monofin appears to many people as very easy because of the natural and graceful flow of the movement. I made my first mermaid tail with a professional mermaid monofin that was specially designed for me by “Specialfins” in the Ukraine. The market price for a fin like this is around 400 USD. It is great to use in strong currents and for deep freedives. I love using this monofin on open ocean swims. 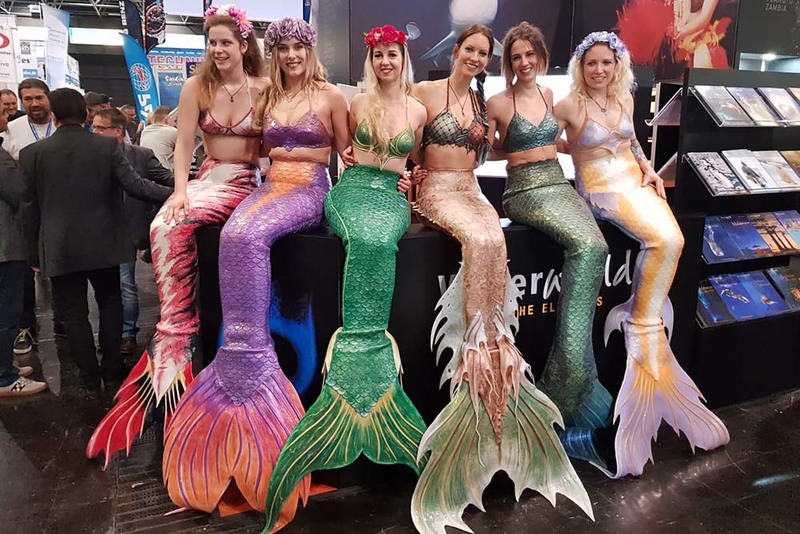 However, there are many different mermaid monofin styles in different sizes, shapes, colours and materials out there. After many years of testing, now I use the “Triton” and “Hydra” monofins in all my mermaid tails. These are great for swimming, relatively inexpensive and easy to transport. I personally think these monofins are the best ones in their price range (around 65-80 USD). They are safe to use for strong swimmers and allow you to do mermaiding as a proper sport. Compared to most other mermaid monofins on the market these are very efficient in the water and have all the important gadgets like separated foot pockets and two different heel straps. I’m also very proud that since November 2016 the “Mermaid Kat Hydra” and “Mermaid Kat Triton” are available on the market. These monofins are the perfect combination of power, efficiency and the real mermaid look. Floating and swimming on the surface can also be something you need to get used to as your legs are attached to the same fin. However if you practice floating on your back and get used to the feeling of a mermaid monofin this can very easily be mastered. As a dive instructor I regularly use bifins in the water but personally I prefer the efficiency and speed of a good monofin. Before you purchase a mermaid monofin check out these safety information.